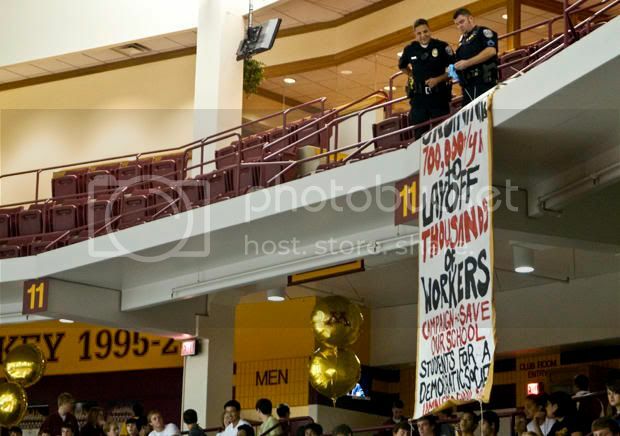 SDS members at the University of Minnesota are facing student conduct code charges for dropping banners at freshman convocation on September 3rd of 2009. These charges include theft, disorderly conduct, misuse of university facilities, and unauthorized access of a university building. What is more, these were charged against us without the university having any sort of proof or evidence that any particular individuals did it. Individuals still enrolled at the U of M were obligated to go to individual interviews with the Office of Student Conduct and Academic Integrity (OSCAI). After the first couple of meetings it was clear to us that the university was employing scare tactics as a way to dismantle the group and “rat” each other out. The OSCAI interviewers claimed that suspension, expulsion, and a revocation of degrees would be possible, and one member did in fact note that the interviewer questioned his ability to graduate. An outpouring of support for SDS came into the inboxes and voicemails of all the individuals in charge of the reprimands our chapter now faces. Students from across the country called in, alumni spouted their disapproval, faculty, graduate students, staff, grassroots organizations all demanded that university drop their outrageous charges against SDS at the U of M. A warm thank you goes out to all who took the time to stand up for free speech, a right to dissent on our campuses, and most importantly to defend SDS at the U of M calling for overpaid administrators to be cut instead of more tuition hikes. Victoriously, the university did drop the charges filed against five students who have already had their meetings. This decision was prompted by the support rallied around SDS. This is only a partial victory as four SDS members are still currently facing charges. Jerry Reinhart, Vice Provost of Student and Academic Affairs, recently announced in the MN Daily paper that SDS members were NOT facing potential expulsion or suspension and in an editorial he wrote, insinuated that SDS and the press were lying about the charges we were told we might face. Not only is this denying what the OSCAI clearly has stated in former meetings but it is also slandering a student group as well as a MN Daily reporter. Reinhart’s public rebuttal indicates that either there is a severe lack of communication between the OSCAI and the administration OR that Reinhart is attempting to clear the university from pressing the charges originally threatened by the OSCAI. The four SDS members currently awaiting their interviews have decided to have legal representatives present at the undemocratic meetings the university decides to hold. Moreover, we are demanding the meeting to not happen individually, but rather all 4 together, as these meetings have shown to be a strategy to separate and divide our organization. We are also demanding the presence of Jerry Reinhart at the meeting, as we believe it to be a positive step forward for the university bodies to get their stories straight on what exactly our potential charges are. We will keep folks updated as things happen and another warm thank you for all the solidarity and support we have received.